Not sure exactly when or what it was that made Sadie and myself decided to drop everything we had in Nottingham and wanted to head off travelling, but as its only 2 weeks today till we leave, I thought I would start a blog of our adventures in the next chapter of our life together. I think it was roughly just before the summer, when both of us decided we wanted an escape from the rat race. Luckily an opportunity arose for us both, so we decided to make the most of it and wanted to go off travelling. 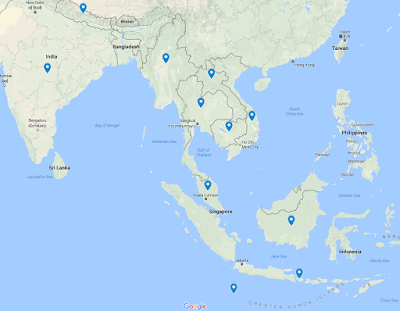 We decided that South East Asia was our main interest, so started looking into it in more detail. This was one of our earlier Google maps pin-pointing the countrys we wanted to visit, sadly Tibet and Bhutan were on it, but are now missing off it due to visa difficulties and the expense to get in and around those countries. 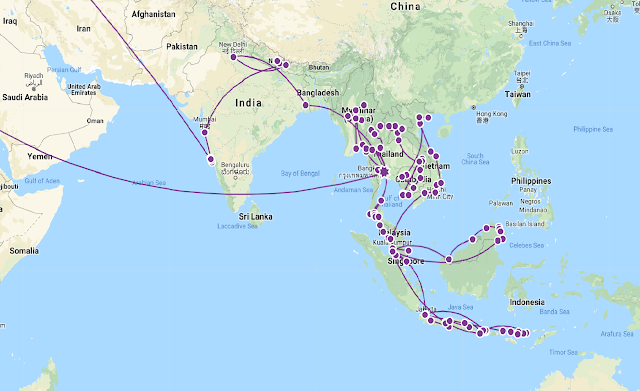 So as you can see, it covers India, Nepal and then onto Myanmar then down through Thailand, Laos, Vietnam, Cambodia, Thailand (Again), Malaysia and Indonesia. We wanted to try and make our trip last about 12 months give or take a bit, and set aside a budget for what we think will cover us for that. It may also change once we do get on the road, as we are going to be pretty fluid about our travels around that area, with no set plan or agenda apart from the initial month or so. So there it is, a huge adventure awaits!